I am something of a cautious baker, and for a long time the thought of attempting to make my own bread left me paralysed with fear. However, thanks to the very generous gift of a Kitchenaid which was going slightly underused, and as I had a glut of flour left over from the time the boy made pizza, I decided to have a go. After all, what's the worst that could happen? Rock-bread? Thankfully, my fears proved unfounded and I shall be making bread again. I might even deviate from a simple wholemeal boule. It is so simple that I'll definitely make it again. Apparently you can leave the kneaded bread in the fridge overnight for the first prove, which really saves time. 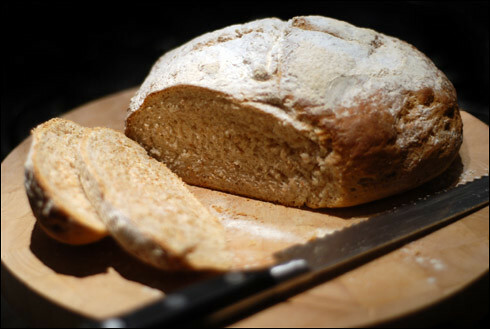 This makes a delicious loaf though - light, a little springy and slightly crumbly with a delicious crust. I worked out that it costs about 80p a loaf too. A definite advantage! Weigh out the flour, add the salt and yeast and then sift into a large bowl. Some of the larger flakes of wholemeal will remain - tip these into the bowl and gently mix them in using a wooden spoon. If you're using a Kitchenaid to knead your dough, transfer the flour to the mixing bowl and make a well in the middle. If you're making the bread by hand, continue to use the large bowl, but also make a well. Pour into the well the olive oil, milk and boiling water - make sure the milk and water have mixed first - you want the liquid to be just warm, or you'll kill the yeast. If using a Kitchenaid, using the dough hook, let it knead on speed 2 for 5-10 minutes. If kneading by hand, mix well then transfer the mixture to a floured surface and knead until the dough is smooth. In both cases, once kneaded, transfer the dough to a lightly oiled bowl, cover with a slightly damp, clean dishcloth and leave to rise in a warm place for an hour. The mixture should double in size. Line a baking tray with greaseproof paper, then knock back the dough and then gently mould it into a ball. Place it on the greaseproof paper and cover with the damp dishcloth. Leave it to prove for another hour. Heat the oven to 200°C, dust the loaf with a little flour and cut a cross about 10cm long into the top of the loaf using a sharp knife. Bake for 25-30 minutes, until the loaf is golden brown and it sounds hollow when you tap it underneath. Cool on a wire rack, and as soon as it's cool enough to handle, cut yourself a slice, slather it in butter and revel in the delights of fresh homemade bread. I love it most when it's still warm, with a little butter and marmite.